Rental companies are playing pivotal role in shaping the global aerial work platforms market. The market comprises scissor lifts, boom lifts, and other types of AWPs. These platforms are used by various end-use industries for regular maintenance, inspection, and other jobs while working at certain height. The use of AWPs has significantly increased with rise in infrastructural activities, and these platforms are usually purchased directly from manufacturers or distributors, which are further rented out. Among the major AWP types, boom lifts are expected to retain a maximum market value share in the years coming ahead. Scissor lifts areused when there is requirement of maximum vertical and horizontal outreach to work at crowded job sites. The market is likely to witness higher demand for scissor lifts in near future, which will reportedly enable scissor lift sales to reach a market value of over US$ 8,600 Mn by the end of 2028. Hybrid scissor lifts are finding higher application scope in the global market. This is a result of the efficiency in performance that hybrid lifts depict. Rental fleet owners also witness a high prevalence of hybrid platforms as it provides flexibility of scissor lift performance for higher utilization and longer term rentals. Hybrid scissor lifts are expected to support the industry hold its focus. Further, as emission standards continue to increase, the complexity of diesel engine scissor lifts will also increase which will be drive the growth of hybrid Aerial Work Platforms in the market. The growth of hybrid lifts is also a result of enhancements in safety standards. OSHA and other associations have developed several standards, which are promoting the growth of the Aerial Work Platforms market. The market is resulting in emergence of safe and efficient working of aerial work platforms. Growing awareness, understanding, safety concerns, and pricing, are expected to serve as the prominent factors limiting the growth of aerial work platforms market globally. High cost of AWPs stands as one major hurdle in the growth of market. Scissor lifts with increased features cost relatively higher than conventional ladders and towers. Subsequently, the number of consumers in developing countries and nations with low per capita GDP are relatively lower than developed countries. Developing regional markets cover a major part of the global aerial work platforms market due to the rise in infrastructural growth and advancements. However, they lack in the capital investments and as a result, have to stick with the traditional practices for carrying out aerial work. Maintenance activities are still being carried out using traditional bamboo and conventional metal scaffolding for minor or major repairs in most of the developing as well as underdeveloped regions. The main objective of the report is to offer insights on the advancements in the global aerial work platforms. The study provides market dynamics that are expected to influence current environment and future status of the aerial work platforms over the forecast period. The primary objective of this report is to offer updates on trends, drivers, restraints, value forecasts, and opportunities for manufacturers operating in the aerial work platforms. A section of report discusses on how the overall competition in the market is steadily increasing. It discusses various factors that are shaping internal as well as external competition in the market. The sales of aerial work platforms and components is estimated to grow at a rapid pace in the near future. 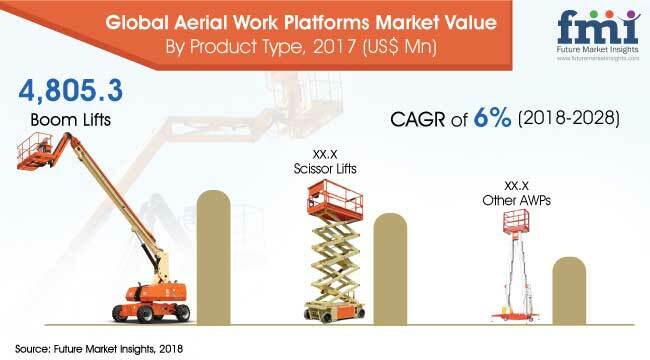 Moreover, rapid growth of construction activities, economic recovery, and rising demand for AWPs are expected to flourish the growth of the aerial work platforms market. The report provides details market share analysis of the aerial work platforms on the basis of key manufacturers. A section of the report highlights country-wise aerial work platforms. It provides a market outlook for 2018–2028 and sets the forecast within the context of the report, including the new technical developments as well as product offerings for niche applications in the aerial work platforms. FMI collects data from secondary sources including company annual reports, association publications, industry presentations, white papers, and company press releases apart from these we leverage over paid database subscriptions and industry magazines to collect market information and developments in exhaustive manner. After being done with desk research, detailed questionnaire and discussion guide is formulated to initiate primary research with key industry personnel; the discussion aims at collecting key insights, growth perspectives, prevalent market trends and quantitative insights including market size and competition developments. Both of these research approaches help us in arriving at base year numbers and market hypothesis. In this phase, FMI validates the data using macro and micro economic factors. For instance, growth in electricity consumption, industry value added, other industry factors, economic performance, growth of top players and sector performance is closely studied to arrive at precise estimates and refine anomalies if any. 16.2.9. Hunan SINOBOOM Heavy Industry Co., Ltd.
16.2.14. Noblelift Intelligent Equipment Co., Ltd.